Los Angeles breweries took over the space where movies are made and photographs are staged for the Los Angeles Beer and Food Festival. Hosted by the Los Angeles County Brewers Guild, over 50 independent breweries and 12 food establishments took center stage for the one-day event to celebrate LA’s beer community and food culture. Los Angeles’ brewing community reminds me of the young and ambitious high school teenagers I used to work with at my previous position. Filled with creativity and innovation, they continue to push the envelope when it comes to brewing and they gain respect from well-established leaders in the process. For example, highly regarded magazine and event producer Beer Advocate partnered with the Los Angeles County Brewers Guild back in December during the west coast expansion of Extreme Beer Fest. My standards were set high for the new release of Cellador’s Berlinish Blueberry and the brewery didn’t disappoint. The ale capitalized on the sweet flavors of whole organic blueberries to balance the tart flavors natural to the beer. I became a fan of LA Ale Works after tasting its Meseeks Joose, a hazy double IPA and cannot wait to visit the brewery to taste its beer-infused slushies. Yorkshire Brewery’s The Jonathan took me on a trip to England in the 1940s where they used real sugar as part of the brewing process. And the tasty bites featured at the festival were a delight. The spotlight sure shined brightly on these Los Angeles breweries making their brewers the stars they deserve to be. 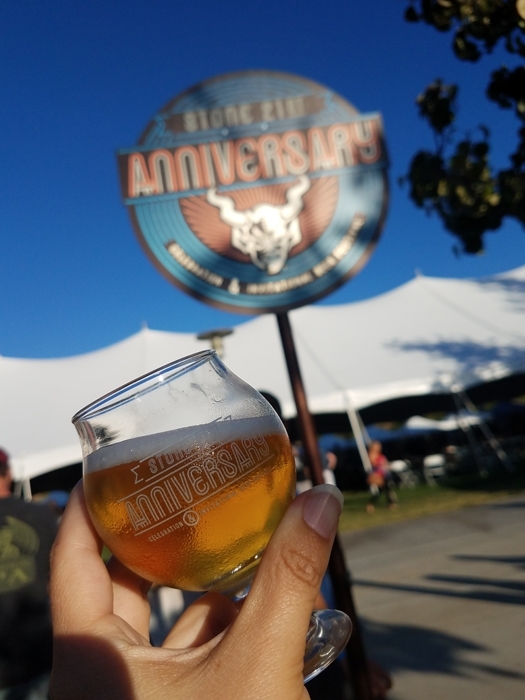 Stone Brewing Company really knows how to throw an epic birthday bash for its 21st Anniversary. 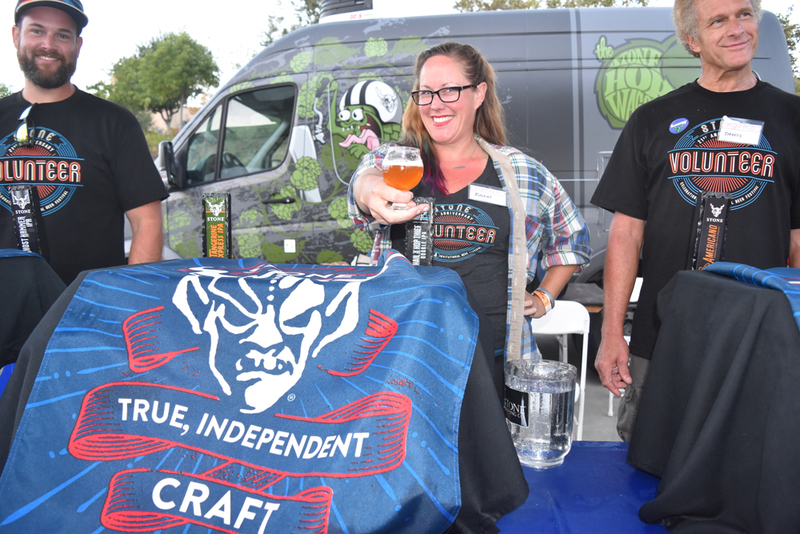 On Saturday, August 19, I had the pleasure of attending the largest independent owned brewery’s 21st Anniversary Celebration & Invitational Beer Festival at California State University, San Marcos. With their festival map in hand, beer connoisseurs navigated the festival grounds to drink as much beer as they could made by Stone, its offshoot brand, Arrogant Brewing, and 57 guest breweries. Craft wine, craft sodas, chocolates, and artisan cheese were offered in case the attendees craved something different. Those who purchased the coveted Rare Beer tickets gained access to a separate section of the festival and Greg Koch, the co-founder of Stone Brewing led a sold-out tasting seminar. Various bands such as the Creepy Creeps and Jimmy and Enrique entertained the attendees, and memories were captured at the various photo spots. My go to beer at the festival? Stone’s Notorious P.O.G., a fruit berliner weisse captured my heart with its citrus taste. 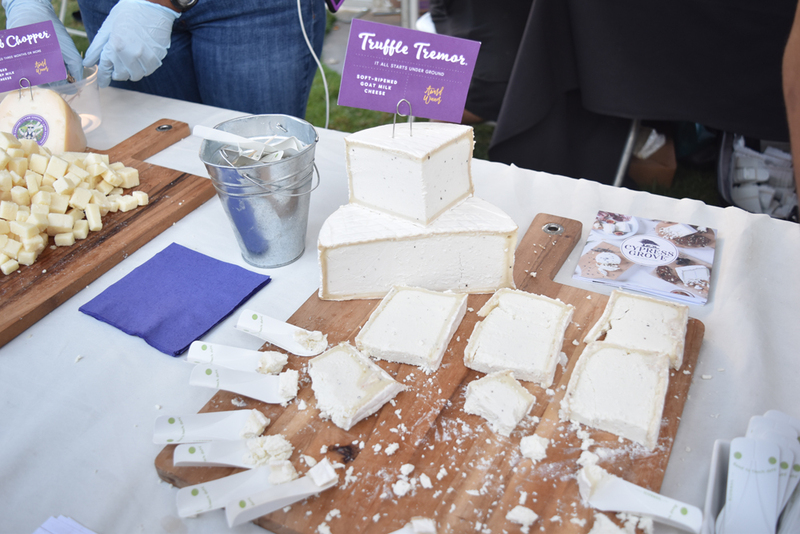 I also need to find out where I can purchase that mouthwatering Truffle Tremor cheese. As an Orange County local, Stone’s Anniversary and Invitational Beer Festival was worth the travel and is now my annual tradition. National S’mores Day celebrates the sweet yet crunchy treat that has delighted several generations around the campfire. 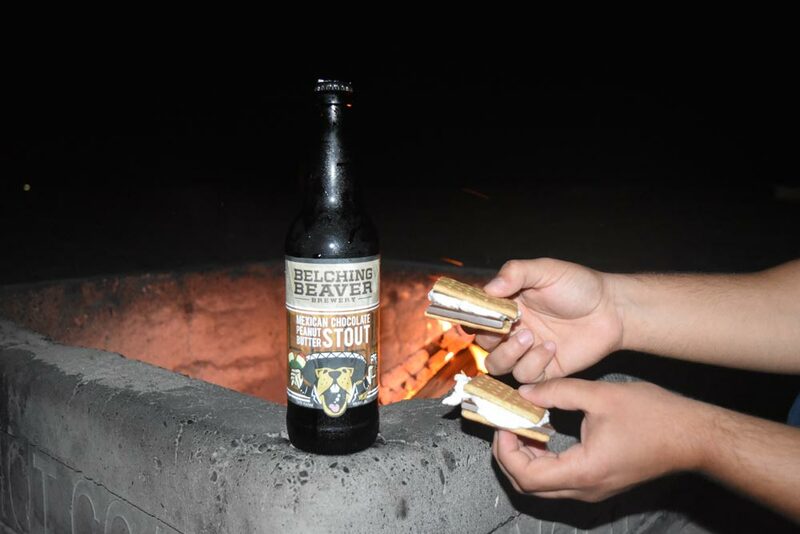 Not just a child’s dessert, adults not only enjoy s’mores but can pair them with adult beverages such as beer. Thanks to Provisions Market in Orange, I have found four craft beers that I will be pairing with my s’mores tonight. I cannot wait to hear about what beers you paired with your s’mores in celebration of National S’mores Day. Thanks Paella Wine & Beer Festival for inviting me to your preview event. I have been having major ‘Spain withdrawals’ since I left the country in January and have been desiring to once again experience the country’s wine, paella, and its beautiful culture. Fortunately, I don’t have to travel far thanks to Orange County’s first Paella Wine & Beer Festival. On the glorious date of August 26, 2017 at the OC Fairgrounds, attendees will have access to unlimited paella, wine, and beer - simply this foodie, beer, and wine lover’s dream. Personally, I plan to not eat breakfast that day so I can eat as much paella as I can. Why do I simply crave for this festival to happen already? I will be one of the attendees at Orange County’s FIRST Paella Wine & Beer Festival. Not going to lie, I love being that girl who knows and shares the coolest events, restaurant openings, and festivals with her friends (which is one of the reasons why I started this blog in the first place). Founded by renowned chef, Armando Rodiel, the festival has occurred in Los Angeles and San Diego the past several years. This year is the first year he is also hosting the event in Orange County. Unlimited paella, wine. and beer. Say no more! Spending five hours eating unlimited paella and drinking as much beer and wine as I want sounds incredible in itself. I fortunately have my fellow foodie and amazing friend Cissy coming with me. We are excited to try all of the paellas, sangrias, cocktails, beers, and wines from Spain and Baja California. I want to know who will be crowned the paella contest champ. The winner of the paella contest will represent the United States at the Paella World Championship in Sueca, Valencia, Spain in September. Isn’t that cool? OC’s contestants include local chefs and schools. I want to see a record broken. To break the record of creating the largest paella ever in the U.S., the executive chef of Villa Roma in Laguna Hills, Chef Leo Razo will use approximately 450 pounds of rice, 450 pounds of protein, and close to 200 pounds of vegetables. The paella is expected to serve 3,000 people. I was fortunate enough to taste Chef Razo’s paella, and damn, it tasted really good! Your eating and drinking benefits charity. Eat, drink, and do good is one of my life mottos and I am happy that this festival enables me to live it. A portion of all ticket sales will be benefiting Canica USA, a non-profit organization that provides life-changing experiences to impoverished children fighting cancer from South America and Mexico. Chef Razo’s wife, Teresa serves as the organization’s president. Want to go to OC’s first Paella Wine & Beer Festival? Tickets start at $50 and can be purchased online at www.eventslanding.com. The event will occur on Saturday, August 26 from 4-9 p.m. at the OC Fairgrounds. Additional information about OC’s Paella Wine & Beer Festival can be found at www.paellawinefest.com. Beerventure: A trip characterized and dictated by one’s obsession for craft beer. Beerventures often involve traveling an extensive distance to visit a series of breweries or attending multiple beer festivals. When I first found out that the San Diego International Beer Festival and LA Beer Week Kickoff event were happening on the same weekend, I immediately booked some Amtrak tickets and a hostel in San Diego’s Gaslamp District. After boarding the Amtrak train from my home base in Orange County on Friday, June 16, I enjoyed a bottle of Stone Mocha IPA while admiring the beachfront views along the train route. First Stop - San Diego International Beer Festival! On Friday, June 16, I started my weekend off at the San Diego International Beer Festival located at the Del Mar Fairgrounds. Although the San Diego County Fair was happening simultaneously that weekend, I naturally spent all of my time at the festival tasting as many beers as I was able to at the largest beer festival on the west coast. Over the course of the three-day weekend, attendees were able to attend up to five, four-hour sessions that served over 300 beers from over 150 breweries. At most beer festivals I attend, I don’t often run into big beer companies such as Anheuser and its presence caught me off guard. The announcer of the evening hosted a variety of fun games for attendees to participate in at the center of the event. I withheld myself from spending all of my money on cool merchandise such as t-shirts, beer coasters, and bottle openers. I really liked that they hosted different food and beer information sessions every hour. At the breakfast and beer session held on Friday evening, Belching Beaver Brewery’s executive chef convinced the audience why beer should substitute mimosas at your next Sunday brunch. I never pictured drinking beer in the morning but now, I am convinced that IPAs and pancakes are a delicious combination. As much as I enjoyed the festival, I wish the volunteers were better trained in explaining the beer I was about to taste. My favorite beer of the festival? Champion Brewery AleSmith has an incredible imperial English-style ale - Private Stock Ale from its 2016 Vintage series. All I wanted to do was savor the toffee notes that hit my taste buds. I am surprised that more beer enthusiasts did not attend this event! On Saturday, June 17, three talented minds in craft beer, Steve Wagner of Stone Brewing Company, Patrick Rue of The Bruery, and Adam Avery of Avery Brewing Co. were on board the Amtrak train en route to LA Beer Week’s Kickoff. Attendees even received a free craft beer from one of the three participating breweries! (They served Stone Ripper, The Bruery’s Or Xata and Avery Brewing’s White Rascal in case you were wondering.) I never imagined myself to be placed in a situation where I was able to meet the masterminds behind the beers I love drinking. All three of them are among the nicest people I have ever met. They interacted with everyone, signed posters, and posed for photos with me. I was floating on cloud nine. I even gained new friends from San Diego who made a strong impact on my beer trip. Although the event was smaller than the San Diego International Beer Festival, I was highly impressed with the organization of LA Beer Week’s Kickoff event. The check-in line looked long from the outside but moved extremely fast. Over 85 craft brewers showcased their best beers at the largest showcase of LA-based breweries. Presented by the Los Angeles County Brewers Guild, big beer definitely was not found at this event. I learned more about what I was drinking thanks to each brewery’s knowledgeable beer staff. The event featured some bands, sold LA Beer Week merchandise, and even was the site of a proposal. (Congratulations to the happy couple!) It was extremely hard for me to find my favorite beer of the festival because every brewery showcased its best. However, towards the end of the event, I found it - The Lost Abbey Brewing Company poured its fantastic Red Poppy Ale, a Flanders red ale characterized by sour cherries. I never thought I would find myself wanting to drink more sweet beer. Honestly, I never imagined how life-changing this beerventure would be. I am so glad that I embarked on this craft beer trip and I cannot wait to plan another one. All I wished for was to find a “chill bar” and I ended up stumbling upon the best cocktail bar in Barcelona, Spain - thanks to my friend, Adam. He researched bars near our hostel, which is located in the Poblenou neighborhood and found some great reviews online about Madame George. Now, all I want to do is tell everyone why I simply crave cocktails from this amazing bar! 1. Madame George’s cozy atmosphere is perfect for outings with friends and significant others. The intimate venue’s energy radiated an aura of warmth the second you entered the bar. The layout of Madame George consists of two rooms complete with seating areas at the bar, at a bar table that lines a wall, and at one of the several clusters of vintage style furniture. Parties of six to 10 people sit inside the bar’s beautiful turquoise room filled with elegant furniture, chandeliers and wall candelabras. 2. Madame George has extraordinary and talented mixologists. Mixing a cocktail is an artform. At Madame George, patrons immediately notice the mixologists’ attention to detail as they craft each cocktail. I was fortunate to have Jenia as my mixologist during both of my visits, and she was incredible! I was intrigued by the way she created each drink with a fluid and technical approach. Despite the busy weekday crowd that she managed by herself, all of my drinks tasted perfectly. 3. Madame George mixes flavorful cocktails. Madame George offers a variety of cocktails that cater to every palate. Craving something sweet? Try the El Pepigroso. Wishing for something that reminds you of chocolate? The Georgette is perfect for you! Even the Madame Old Fashioned tastes incredible with the orange bitters complementing the whiskey. The bar’s own creations all infuse ginger beer - definitely something I savored in my drinks. They also serve patrons classic drinks, such as a Long Island Ice Tea, a Whiskey Sour, and a Mai Tai. Madame George’s menu undergoes slight changes every evening. Since Adam and I loved this bar so much, and raved about it to our friends the next day, we went back for round two. This time, we brought more friends! Our second experience equally matched our first time. Madame George definitely enhanced my travel experience. This extraordinary cocktail bar in Barcelona is definitely worth the visit! Madame George is located at Carrer de Pujades, 179, 08005 Barcelona, Spain. On Mondays through Thursdays, the cocktail bar is open from 18:00 (6:00 p.m.) to 02:00 (2:00 a.m.). On Fridays through Sundays, Madame George’s hours of operation are 18:00 (6:00 p.m.) to 03:00 (3:00 a.m.). Additional information about Madame George, my favorite cocktail bar in Barcelona, Spain can be found at www.madamegeorgebar.com. While walking through Baden Baden’s Christmas Market during freezing weather, I craved a tasty drink that would keep me warm while I shared a warm waffle drizzled in nutella with my friend, Jackie. In the United States, people often connect hot chocolate, hot tea or coffee as the beverage to drink during cold weather. Although Germany offered these hot drinks, many Germans and tourists drank glühwein (pronounced ɡluːvʌɪn) or mulled wine as they wandered the rows of booths displayed at the Christmas Market. Translated as “glowing wine,” Glühwein is made from red wine that is heated and spiced with cinnamon sticks, cloves, star anise, and orange juice with zest and sugar. You can also drink the mulled wine “mit Schuss” (with a shot) of rum or some other liquor. Glühwein’s taste reminded me of a warm, cabernet sauvignon, but with a slightly sweeter finish. The glühwein I drank with a shot of rum gave the beverage an extra kick. My favorite mulled wine that I tasted during my stay in Germany is heidelberr-Glühwein (blueberry mulled wine). I truly savored every sip of this drink, since I absolutely love the sweet taste of blueberries. 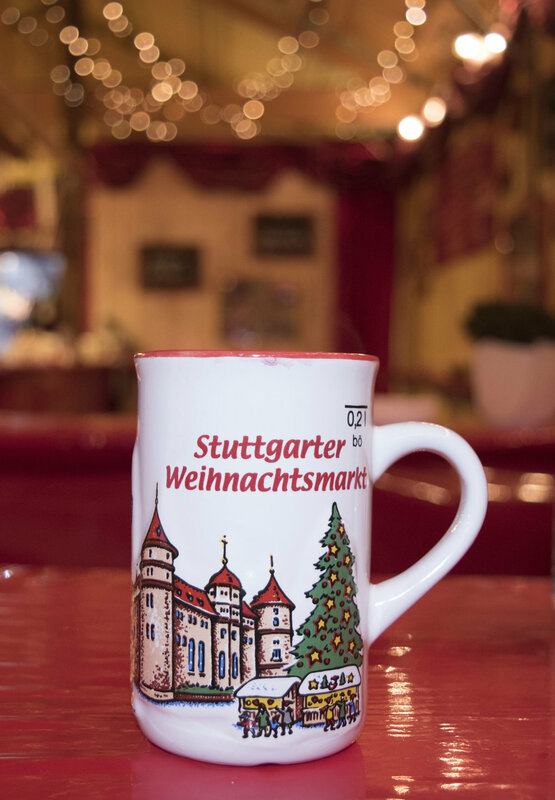 Vendors at the Christmas Market served glühwein in specialized mugs made specifically for the event. When you purchased the glühwein, you paid approximately €2.50 in addition to the price of the glühwein for the mug. This practice enables Christmas Market visitors the opportunity to take the mug home, or to receive their money back after returning the mug to the vendor. Although I did not take the physical souvenir home, I will never forget the taste of glühwein.